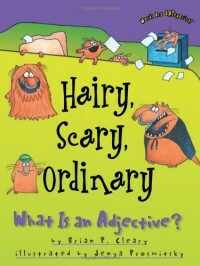 Hairy, Scary, Ordinary is part of a great series on different parts of speech. It teaches about adjectives. The illustrations and text are engaging. I would use this book to introduce or review adjectives. We could identify adjectives we see around the room, or work in groups to identify the most adjectives in the room in a time frame.